Las Vegas – This summer, the Octagon returns to the Empire State for its Long Island debut, and the area’s favorite son, Baldwin native and No. 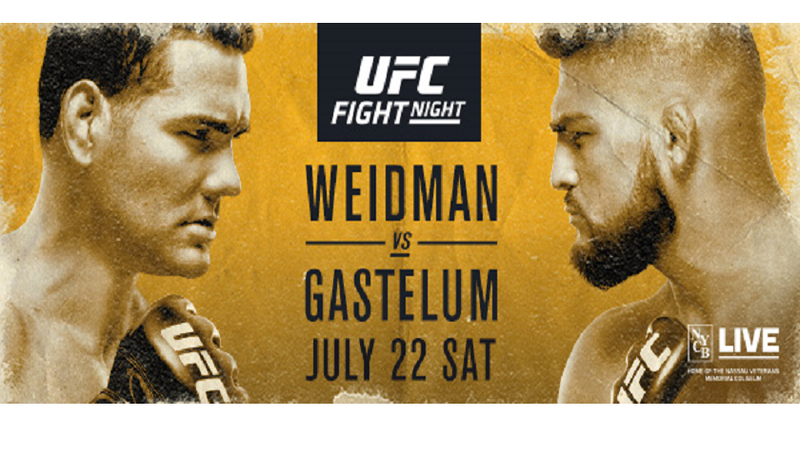 6-ranked UFC middleweight Chris Weidman, gets the chance to compete in his backyard for the first time when he meets surging phenom Kelvin Gastelum in the main event of UFC® FIGHT NIGHT: WEIDMAN VS. GASTELUM, Saturday, July 22 at NYCB LIVE, home of the Nassau Veterans Memorial Coliseum. The event will be broadcast live on FOX. The fight card will be stacked with homegrown Long Island UFC® talent who will keep local fans in a New York state of mind. Long Island’s own Chris Weidman (13-3, fighting out of Baldwin, N.Y.) steps back into the Octagon against dangerous knockout threat Kelvin Gastelum (14-2, fighting out of Yuma, Ariz.). The former champion Weidman hopes to earn his way back into title contention by adding another exciting finish to an already impressive resume that includes six knockouts and three submission victories, six of those coming in the first round. His opponent Gastelum, winner of The Ultimate Fighter® season 17, is undefeated since moving up to middleweight, and is looking for the biggest victory of his career, as the winner of this bout could be knocking on the door of title contention in a loaded 185-pound division. No. 10-ranked featherweight Dennis Bermudez (17-6, fighting out of Lindenhurst, N.Y.) also looks to impress local fans against No. 12 Darren Elkins (23-5, fighting out of Portage, Ind.) in a battle of 145-pound contenders. Bermudez gets a home game for the first time in his six-year UFC career and will undoubtedly be looking to put on a show. Hoping to play spoiler, Elkins returns to the Octagon for the first time since his potential Comeback of the Year performance against Mirsad Bektic at UFC® 209. Another fight that will get fans on their feet is a light heavyweight matchup between No. 11 Patrick Cummins (9-4, fighting out of Dana Point, Calif.) and No. 13 Gian Villante (15-7, fighting out of Bellmore, N.Y.). Like Weidman, Cummins starred at the collegiate level, earning NCAA Div. I All-American honors twice. Since transitioning to MMA, he has become a well-rounded and versatile competitor who possesses the ability to win a fight wherever it goes. Villante, known for his power, has 10 knockouts in 15 career wins. Growing up in nearby Levittown, he looks to gain serious momentum with a great showing against his opponent. A bantamweight showdown between two of the division’s hottest contenders, No. 5 Jimmie Rivera (20-1-0, fighting out of Ramsey, N.J.) and No. 9 rankedThomas Almeida (21-1-0, fighting out of Sao Paulo, Brazil). Fast rising and undefeated prospect Shane Burgos (9-0, fighting out of Monroe, N.Y.) will fight in New York for the third time in as many UFC bouts when he faces submission ace Godofredo Pepey (14-4, fighting out of Fortaleza, Brazil) at 145 pounds. Chris Wade (11-3, fighting out of Islip, N.Y.) hopes to be inspired by hometown support when he meets Frankie Perez (10-3, fighting out of Howell, N.J.) at 155 pounds. No. 12 heavyweight Timothy Johnson (11-3, Fargo, N.D.) looks to continue his climb up the rankings when he squares off against Junior Albini (13-2, fighting out of Paranagua, Brazil). Dynamic finisher Damian Grabowski (20-4, fighting out of Opole, Poland) clashes with knockout artist Christian Colombo (8-2-1, fighting out of Copenhagen, Denmark) in a heavyweight duel.